Today was a beautiful day, so it seemed very wrong and counter productive to stayindoors. We’ve been growing our first batch of tomatoes, and have been watching each day for changes. It has been very exciting for my husband and I as we’ve watched them change from a yellow blossom to full grown and ripening tomatoes. Today I noticed this one cluster that was an eye catching gradient from green to orange. The colors were so beautiful together, I just knew that it had to be the subject of my painting, today. Here was my set up as I created a studio in my backyard. I have everything I need, here. My pallet is a plastic box that has some very thin and wet sponges on the bottom. Then I place a special paper that stays wet along with the sponges underneath. This way my acrylics remain wet and usable instead of drying out within a short period of time. I use acrylics as if they are watercolor paints. Very thin layers of acrylic are perfect for me as they cannot be re-wet or reworked. After a significant time of painting, it was necessary to take a five minute break to cool off in the pool. Then it was back to the work at hand (if I can, in fact, call it work). surrounded by the sounds nature around me. 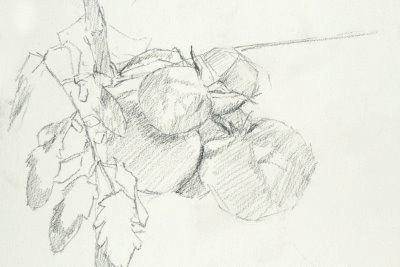 This entry was posted in Painting Progression, Paintings and tagged progression, vegetables. Bookmark the permalink.